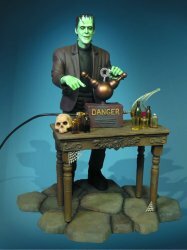 Assemble Dr. Victor Frankenstein's monster with The Munsters Herman Munster 1:10 Scale Model Kit! Once assembled, the good-natured Munster family patriarch stands about 8 1/4 inches tall. Herman comes with a cobblestone base and an old and ornate looking desk that's home to chemistry equipment and a skull. 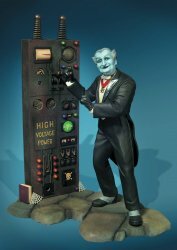 You can even combine the Herman Munster 1:10 Scale Model Kit with the Grandpa Munster kit (as shown but sold separately) for an even more spectacular decorative piece! Use the button below to order both. Glue and paint required, not included. Skill level 3. Ages 15 and up. Photos show box art and sample buildup professionally constructed and painted. Collectors Note: Brand-new, factory sealed thin-walled boxes are tightly shrinkwrapped and may have a crimped edge or two from the manufacturer. Moebius customarily does not intend for the box to be a collectible.